How many hours of your life have you wasted because you were looking for that specific design that your designer created for you, or that you had created 3 days previous but were not sure what folder you put it in? Perhaps you were trying to find a design because it was removed from Merch by Amazon and you want to put it back up… but you aren’t sure where you put the file/folder OR excel spreadsheet with your listing data? If you are anything like me, you are spending way too much time trying to figure out some form of organization for your Merch business and get crucial information of how many designs you have in a niche. THIS is a problem! 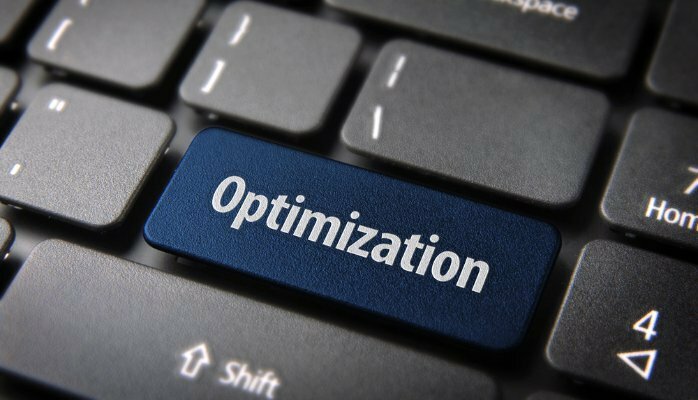 Instead of building and scaling our businesses, we are squandering time, effort and energy that leads to being less productive and adding FAR less to our bottom lines. A little over a year ago, one of my good friends Greg was listening to me rant on this problem I was having. He proposed a simple solution. What if there was a software that could organize all your designs, all of your listing data, give you crucial information on what niches you were deep into and which you were not, AND tell you what products you had uploaded and which you were missing? What if it could eventually tell you if a design was uploaded to Merch and Redbubble but that you had forgotten to list it on Etsy? I had had just about enough of trying to organize my designs on a single computer, and was having an even bigger headache getting a proper structure set up between 4 computers and the house tablet, so I thought that idea sounded pretty great. 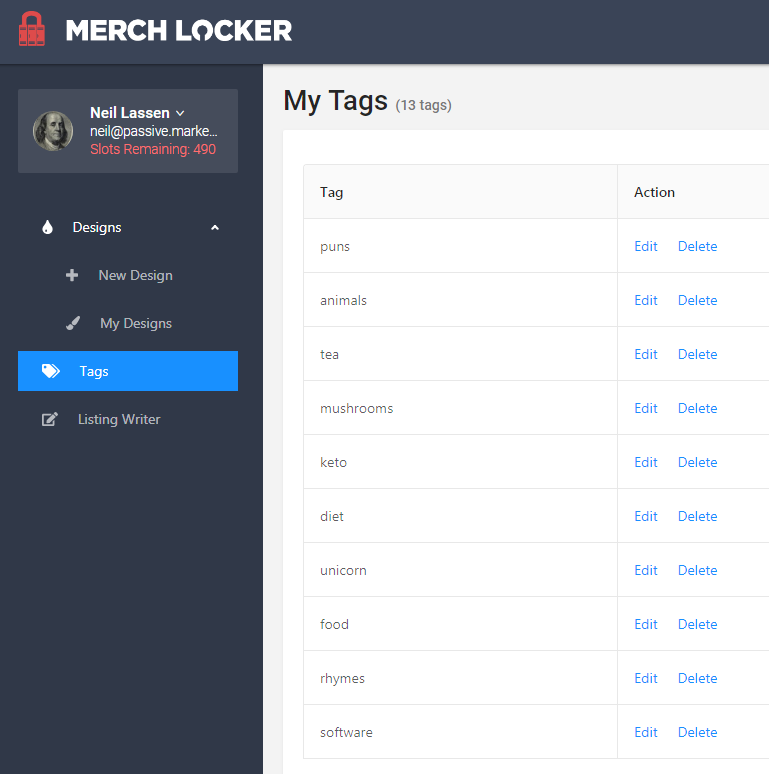 We have created that software, and are proud to announce that Merch Locker is now live and available to everyone in Beta. By the end of this article, you (or a VA!) 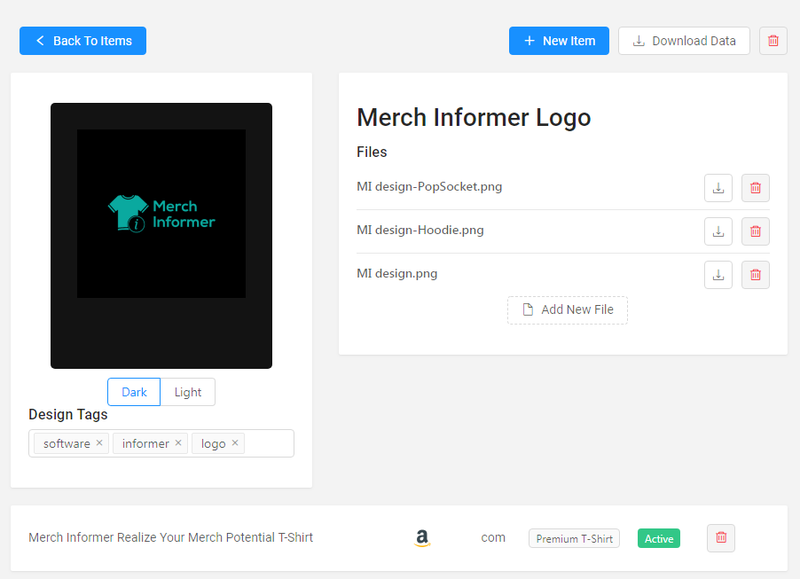 are going to be able to take your ENTIRE library of Merch designs and get them all organized in one place that is accessible to you anywhere in the world. The beauty of this is that not only will you have all your listings in one place, know what niches you need to “fatten”, and have all your listing data in one place, but you can GIVE THE KEYS over to a trusted VA to upload your entire portfolio onto other POD (print on demand) platforms to scale your business and put more money in your pocket. Let’s jump into how to set everything up! The first thing you will want to do is head over to and grab a Merch Locker account. Grab a Merch Locker account here: https://merchlocker.io/. Click on register and go ahead and sign up for an account. Each subscription comes with a 7 day trial to play around with everything and get a feel for how the software can help you. The level you sign up for is going to determine how many designs you have (designs, not products). Once you have an account set up, you are brought to the main dashboard. This dashboard does not have much on it yet, so lets change that! From the left hand menu, the first thing you want to click on is “New Design”. Start by giving your design a name. This name should be something meaningful. I like to put what the actual design says. Note: The design name should be the name of the DESIGN and NOT the product. Once you have given your design a name, drop your files into the upload box. I like to upload all 3 at once (t-shirt file, hoodie file, popsocket file). This should cover all the products currently available on the Merch by Amazon platform. All that is left is to simply click submit. This will upload your design so that you can access it anywhere in the world that you have an internet connection. Note: Whatever file you upload FIRST will become the thumbnail of your product. 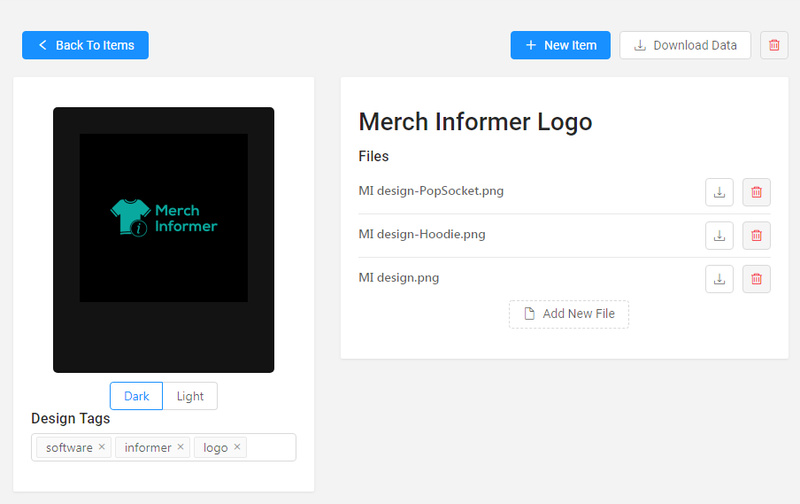 You will see your files to the right side of the screen and on the left you will see the design that you can switch between dark and light to preview what your product will look on light/dark colors. Right below that, you will see a spot for design tags. This is incredibly important that you fill these out because THIS will let you see how many designs you have in any particular niche when you have your entire portfolio in one place. As you can see, I gave this design a few tags. Now that you have files uploaded and tags added, it is time to add your items (products) that are live on Merch by Amazon! Click on the “New Item” button at the top right. You will want to fill out the item information (platform, assign the design to a file, pick the market, assign the item an ASIN, title, and type). The platform, file, market, and type all have drop down menus. Currently Merch Locker supports the Merch by Amazon platform but as it grows, more will be added so that you can easily expand your POD empire. As you can see in the listing above, I assigned this product to the design file for t-shirts, gave it an ASIN, and selected that it was selling on Amazon.com as a premium shirt. Once you have that filled out, click on submit. You can now see that this design has 1 active product (premium shirt on the Merch by Amazon marketplace on the .com locale). Just like that, you now have saved listing data that can be used ANYWHERE you want. If your product ends up coming down, you can put it back up with the same brand, bullet points, title, and description. 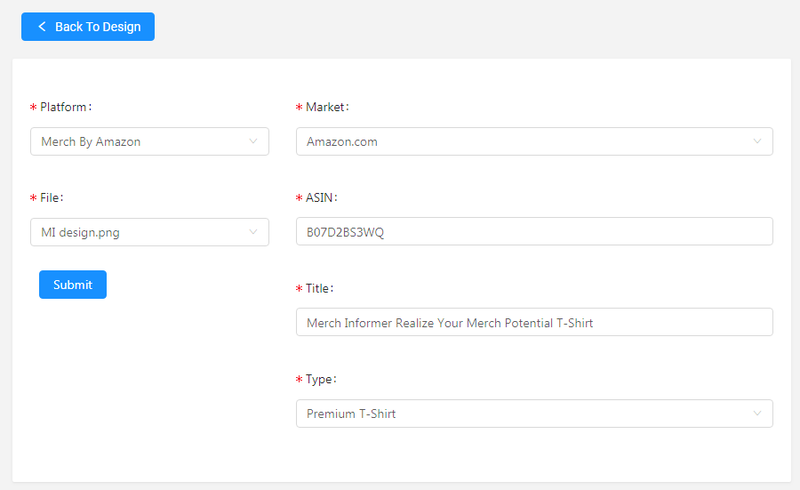 If you want your VA to upload your shirt to another POD (print on demand) platform, you have this information as well! Below, you will see the sales history over time. This will populate overtime so you can see how your product is doing. Go ahead and add a few more designs. We can then go over some of the sorting features which makes Merch Locker special. The entire reason why Merch Locker was build was because we had NO IDEA how many designs we had in a certain niche, what designs were active on Amazon and which we forgot to put back up. This is all fixed with the Merch Locker search functions. 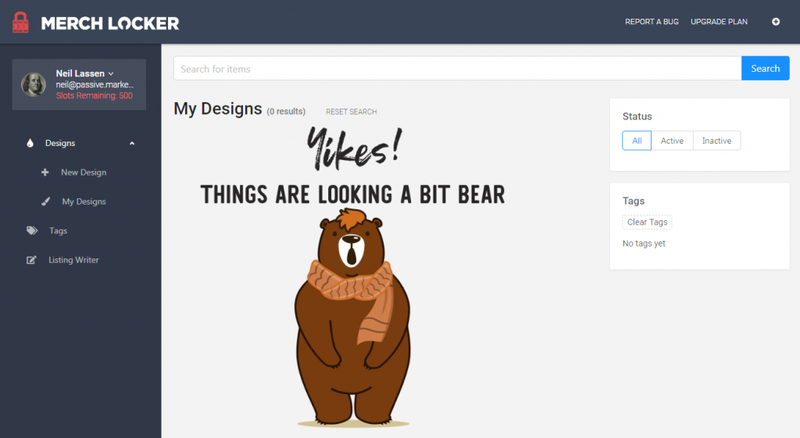 Go ahead and click on “My Designs” from the left hand menu. This will show you all the designs that you have uploaded to the system. If you want to search for a specific item, you can use the search bar at the top. This is pretty straight forward. The options to the right hand of the screen are what you will want for some crucial information about your portfolio. The first is the status. Is your design active, or inactive? This is good news when you select inactive. 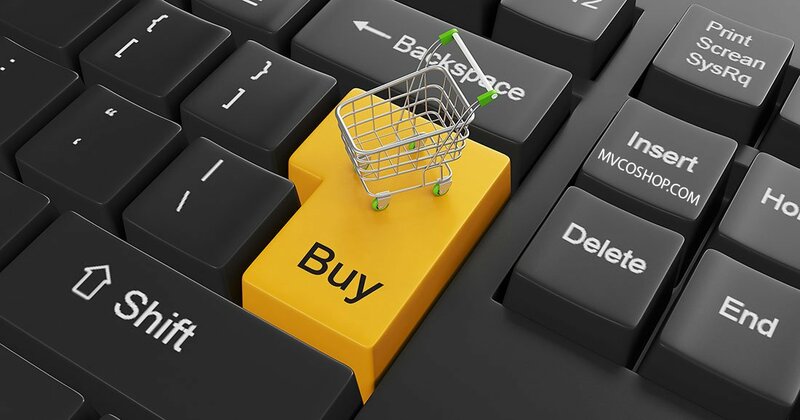 This means that all your products are live and for sale! Imagine what this will do when Merch Locker supports more platforms? Is your product uploaded to a hoodie on Merch by Amazon but only a t-shirt on Redbubble and missing COMPLETELY from Etsy? You can see where we are going with this. This feature is only going to get better and better as you build out your print on demand business. Now, for the best part! Have many times have you heard the phrase “fatten your niches” or been asked “how many niches are you in”? Perhaps you have been asked “how many unique designs do you have in each of the niches you are in”? These are all CRUCIAL bits of data for running a print on demand business. The issue is, 99.9% that read this DON’T KNOW! You might have a general idea, but this is not going to do. This is similar to driving a car down the highway without a valid drivers license and blindfolded. You know you are on the road (or when you swerve, crash and die), but you have no idea of the clear path forward. Merch Locker gives you all of this information! Remember those tags that we filled out earlier when we were adding our designs? This is your ticket to answering all of those questions about your business. You can see that we have 10 designs uploaded, with 13 tags. This data becomes very valuable the more designs you have (full portfolio account), so that you can see if you are spreading yourself too thin. Remember, this is just a test account with 10 designs uploaded. How many designs do we have in the animals niche? Simply click on the animal tag on the right hand menu and just like that, you have your answer! You can see that we have 2 designs out of our 10 total that have been tagged with animals. We can quickly see that 20% of our design portfolio is in this niche. You can use this tag feature to find niches you might be in and selling well, that you want to take another look at to fatten up those niches and give the market some more products. Perhaps we made a mistake there and wanted the tag to be called “animal” and not “animals”. That is incredibly easy to change, which will update all the products that have that tag. Simple go to the left hand menu and click on tags. Simply click on Edit and change the tag to what you want. In this case “animal”. Manually swapping in and out the different products of your bullet points can be a downright pain! I would know, I have done it tens of thousands of times! The list writer does a great job of speeding up that process! Click on play on the video above which goes over the listing writer! 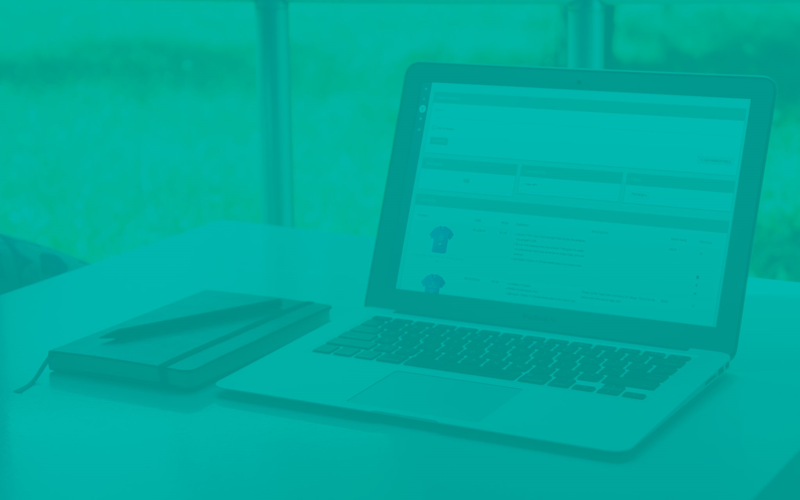 That about wraps up the features of Merch Locker and how it can be used to build your print on demand business. 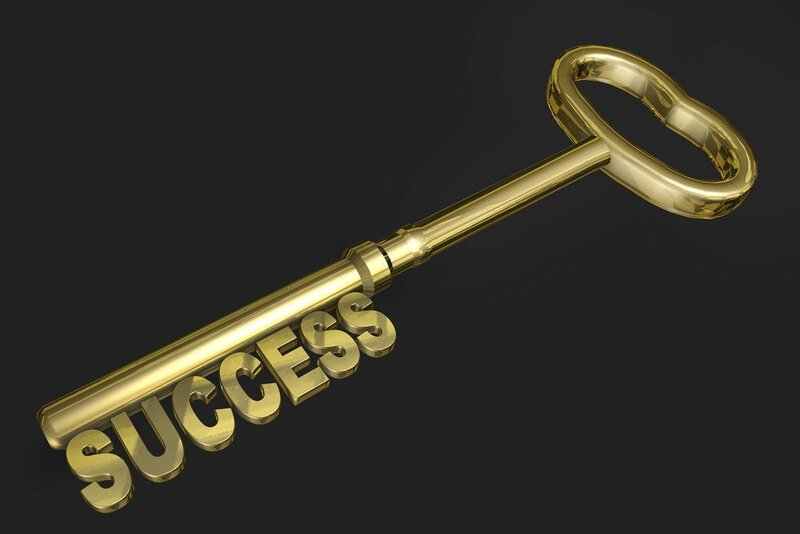 This software will give you access to your entire business anywhere you have internet access. Not only that, but this is literally the keys to expanding your business by outsourcing uploading your entire catalog to multiple other platforms. You can even hire a VA to import all your products to the software as well! This is your chance to get in on the ground floor of a product in beta that will only get better with time! 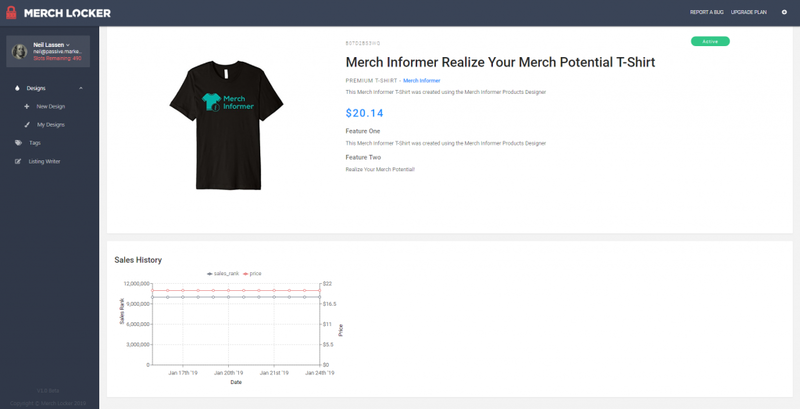 If you are familiar with Merch Informer, you know that we support and build out our products to best suit our customers business. This is no different. As with everything where does the data live? By the question below I assume Merch Informers servers? Nothing is stored on a server owned by Merch Locker or Merch Informer but on an Amazon server. Neil, one question please: Some of my t-shirts do not appear in the Amazon search engine. Can I do something about it? You will just need to be patient and wait for Amazon to work on their indexing issues.